Several years ago I went on a business trip with NASA to the Marshall Spaceflight Center in Huntsville, Alabama. After work, two of my co-workers invited me to join them at a local pub for dinner and darts. I’d planned on writing my sci-fi novel, but the invitation caught my interest. I went, played, and got crushed by Dennis Davidson, then the manager of Program Planning and Control for the Space Shuttle Program. Dennis took a few minutes afterward to answer my questions and teach me the games called Cricket and Loops. When I got back to my hotel, my brain kept replaying my losses, recreating the warm dark tones of the second story pub, and watching with fascination as Dennis’s darts thunked home in the soft sisal fibers of the Bull’s Eye. When I woke up, I had the beginnings of a story: what better way to force a bunch of fantasy characters into the same room together? It took me a few tries to get the story right, but I’ve never had more fun writing fantasy. Magnus is breathing heavy like a big horse on a quiet night, with Timnus and Valery crammed in on either side of him, dead asleep. They aren’t picky. I’m not sure how the three of them fit in the master bed, since Valery is all legs and Timnus has melon-sized elbows, but they do. And no one is fighting for the blanket since Magnus is throwing off heat like a furnace on a cool autumn night. Ahh. I love the quiet solitude. I’m thinking of my soft straw pallet in the attic as I wash the blood, soot, poison, and excess antidote from my hands and forearms. Washing. Falling asleep at the water basin. I head for the attic. Who, in Pan’s name, is prowling about the neighborhood at this ungodly hour, bestowing their blessing on us? I hear a soft voice outside—a pleading, familiar voice. She’s got a stiff upper lip, but I can tell she’s hurting, and that makes me hurt even more. That shop meant everything to her. “I’m so sorry, Carmen.” I say, making room in the narrow stairwell. For a moment she’s buried her face on my shoulder, sobbing. I put my arms around her and wait, wishing things had turned out just a little bit differently for her tonight. Then she’s wiping her eyes. Then she’s climbing the stairs determinedly up to the apartment and I follow behind, listening to the swishing of her soot-caked dress. “Not much to eat, though,” I mutter, but she’s too tired to hear or care. I get her settled at the small wooden table and bring her the refilled wash basin, but she’s asleep at the table before she’s finished washing half her face. I sigh. At least that means she feels safe here. It’s not a joke. It’s Lucinda. She’s got an armful of fresh bandages. She doesn’t wait for an invitation but pushes her way in and rushes up the stairs. Next week I hope to have a post about my trip to New York. Cheers! Still, I shouldn’t hold that psychological damage against Jane Austen, right? It took a thoroughly respectable friend to set me back on track. She caught me by surprise when I learned that Persuasion by Austen was one of her favorite books. Until then though, I had only the light of Twilight to guide me. . . During this dark period, I went so far as to attend a movie viewing of Eclipse with the aforementioned sisters, though I was smarter this time and took along my older brother for protection. We’re not Twi-hards—any of us—but the movie was entertaining, especially when my brother whipped off his shirt at the end and howled at the moon of closing credits. Those Cinemark patrons exiting the theatre with us laughed and cheered, though some appeared concerned with the physical inaccuracies of comparing ourselves to Taylor Lautner’s band of brothers. My physique isn’t bad for a guy who only plays soccer once a week and rarely visits the weight room, but my skin gets a bit pale in the winter—say, the color of wet marshmallows. My ancestry can’t help it. My brother has a similar skin tone, and though taller, is a wee bit on the thin side. The blinding Norwegian flash in mid-winter Tinsletown lights probably sent a myriad of mixed messages. How could werewolves get so pale and hairless? Shouldn’t those two be cheering for the vampires? Could Stephanie Meyer please write a book encouraging young men to keep their shirts ON? Eventually we decided—you can’t tell werewolves what to wear—to put our shirts back on. Fine then. Lunar eclipse complete. 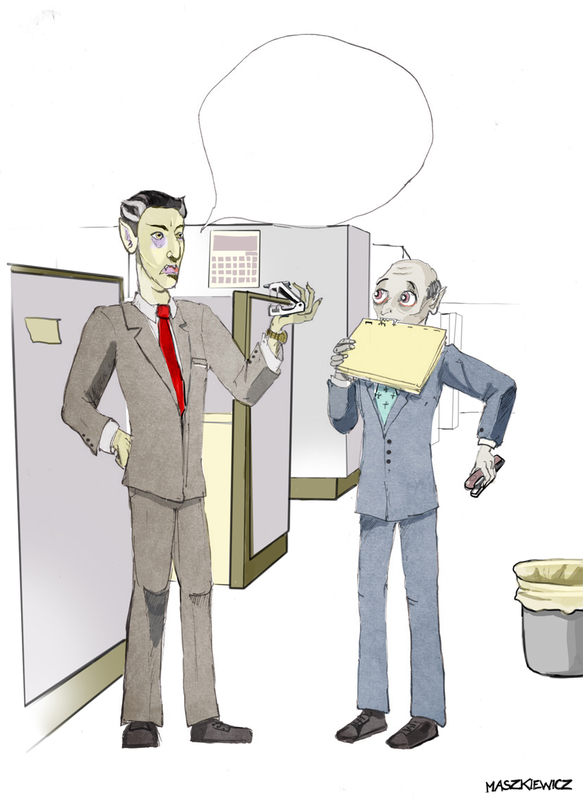 And then, sitting at my desk one day, trying to pull a miss-staple from a stack of budget documents with my vampliers, the entire of spectrum of vampire humor (mostly red) was briefly opened to my view (see picture below). 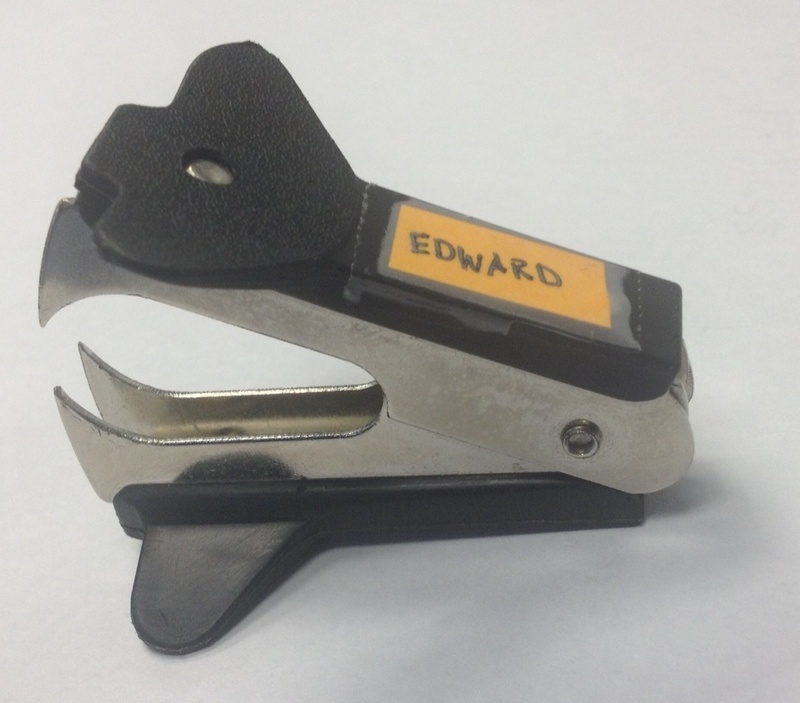 In four years, not one person at NASA has ever asked me why my staple remover has the name Edward taped to it. Career mismatch? Too few scientists interested in problem of vampirism? I guess that’s life. Fang you all very much. And Subscribe. Typing away at my keyboard, I hear the UPS guy outside my office window and the thump of a heavy package on our doormat. It cuts through the patter of falling rain even more than the doorbell. Good thing too. It’s already damp in the 15 seconds it takes me to dash out and rip it open. Beautiful, beautiful books. . . They’re at least twice as good-looking as the kindle version, if a little on the thin side. Something to improve on for RINGS. I wouldn’t mind so much if they paid rent . . .
By now we’ve seen several of these unwelcome under-the-deck tenants. I have it on good authority that they’ve been hanging out by the compost behind the garage smoking doobies until the wee hours of the morning. They’re a bad influence on the neighborhood cats. What sorts of guests do you get?